Are you worried about the increasing number of pending claims and the accuracy of medical codes? Is the untimely reimbursement a cause of concern for you? An expert understanding of ICD-10 and CPT codes bring dramatic changeover in the way you get paid. It also clarifies disease management, simplifies research approach, and explains how to pursue public health. Outsource2india is a leading medical coding service provider with almost two decades of healthcare support service experience. Our medical coders are proficient in documenting the patient's medical state with an appropriate code, thereby leading to timely claim payments for your healthcare facility. Also, our medical coding quality and safety standards are risk-stratified. Outsourcing CPT and ICD-10 coding services to us will help you save time and boost your healthcare organization's cash flow. 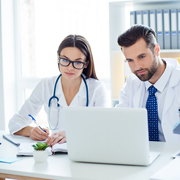 You can send us the scanned medical procedure document by uploading it to a secure FTP location, or allow our medical coders to access your practice management software (PMS) through a secure VPN connection. Our medical coders will translate those into the proper codes as per the diagnosis and procedures performed by your healthcare professionals. At this stage, our medical coders will turn the procedure reports into correct medical codes and enter it into the system for claim processing. Our medical coders & certified senior coding staff exercise strict quality measures to eliminate any discrepancies or gray areas by auditing each file for accuracy of the assigned codes. Our quality assurance team verifies the patient charts for up-coding or down-coding as well. Upon translating the procedure notes into diagnostic and procedural codes, our medical coders submit those coded charts either by uploading onto a secure FTP location, email, or PMS. Thereby, the medical biller creates an insurance claim and transfers this to an insurance company. Lastly, we will share the medical billing and coding best practices with the client. Client's feedback is used as an opportunity to serve them with the better coding service. We follow some of the efficient medical coding processes which enable us to provide our clients with highly affordable medical coding services. We offer complete, accurate, and safe ICD-10 and CPT coding services that improve your performance and contain costs. This, in turn, will help you to forecast the healthcare needs & trend, analyze the associated costs, and reorganize your administration. All our medical coding processes are HIPAA compliant and you can be assured that all your confidential patient data is completely secure with us. At Outsource2india, we have established rigorous privacy, security, and confidentiality safeguards at each level of our department. We have established SOPs, regular and tailored training programs, Quality Assurance (QA) inspections, and sharing of best practices across the organization which helps us offer best medical coding services to you. We make use of some of the best and latest medical coding tools to ensure that we provide our clients with the best quality and accurate coding services. We make use of ICD-10 compliant coding tools to ensure that you get the best and accurate coding services. Whatever might be the capacity of your healthcare organization, our team of expert medical coders make sure that every coding work is done securely and without obstruction. Our team of expert medical coders has access to some of the best infrastructure needed to provide you with the best quality medical coding services. Our multiple delivery centers are outfitted with the advanced infrastructure required to provide high-quality ICD-10 and CPT coding services. We have built-in IT redundancies, 200% power back up, firewall and intrusion detection technology, etc. Our high-end infrastructure reduces the chances of errors happening during the coding and billing process. We have a team which comprises of the most talented, well-trained, and experienced ICD and CPT coders who can cater to any of your medical coding needs. At Outsource2india, we have a healthcare & an insurance support team of 50+ experts. Our experienced ICD and CPT coders follow the mandated guidelines, which results in fewer claims getting rejected. Thus, you will see more timely payments and lesser denied claims to bother about appealing. O2I helped a Maryland-based medical billing company clear their medical billing and coding backlogs within a turnaround time of 12 hours. Outsource2india has been a leading provider of medical coding services and a series of other medical billing and coding services. Having been in the healthcare service industry for so long now, we have gained enough experience to understand each client's requirements and provide the services accordingly. Our team of expert medical coders is trained to cater to any of the healthcare organization's needs. Our multiple delivery centers spread across time zones help us deliver the medical coding services within a short time. We understand the importance of data security when it comes to patient data and assure you that all your data is completely safe with us. Read the case study to know how "Outsource2india Assisted a Florida-based Medical Billing Company with ICD-10 Implementation". Our team of certified multi-specialty coders provide a full suite of ICD-10 and CPT coding services. If you are looking for a safe, accurate, efficient, and cost-effective CPT and ICD-10 coding service provider, then look no further. Get in touch with us today!